August 18, 2011 - On Tuesday, the first A380 for China Southern Airlines took to the skies for the start of a final phase of flight and ground tests. The tests are being carried out from Airbus' facilities in Hamburg, where the aircraft has undergone painting and full cabin furnishing. During the upcoming program of flights, all cabin systems will be thoroughly tested, including air flow and air conditioning, lighting, galleys, lavatories, seats and in-flight entertainment. In parallel, Airbus will also undertake advanced general performance tests with the aircraft before it flies to Toulouse for preparation for delivery to the airline. China Southern Airlines will become the seventh operator of the A380 when it begins flying the aircraft later this year. The aircraft is configured with 506 seats in a three-class lay-out with 8 first, 70 business and 428 economy class seats. 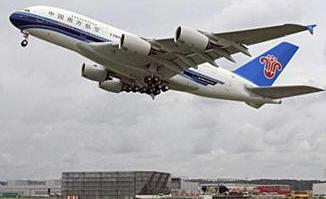 Altogether, China Southern Airlines has placed firm orders for five A380s. The Airbus A380 is a double-deck, wide-body, four-engine jet airliner manufactured by the European corporation Airbus, a subsidiary of EADS. It is the largest passenger airliner in the world. Due to its size, many airports had to modify and improve facilities to accommodate it. Designed to challenge Boeing's monopoly in the large-aircraft market, the A380 made its maiden flight on 27 April 2005 and entered commercial service in October 2007 with Singapore Airlines. The aircraft was known as the Airbus A3XX during much of its development, before receiving the A380 model number. The nickname Superjumbo has since become associated with it. The A380's upper deck extends along the entire length of the fuselage, and its width is equivalent to that of a widebody aircraft. This allows for an A380-800's cabin with 478 square meters (5,145.1 sq ft) of floor space; 49% more floor space than the current next-largest airliner, the Boeing 747-400 with 321 square meters (3,455.2 sq ft), and provides seating for 525 people in a typical three-class configuration or up to 853 people in all-economy class configurations. The A380-800 has a design range of 15,200 km (8,200 nmi; 9,400 mi), sufficient to fly from New York to Hong Kong for example, and a cruising speed of Mach 0.85 (about 900 km/h or 560 mph at cruising altitude). As of July 2011 there had been 236 firm orders for the A380, of which 53 had been delivered. The largest order, for 90 aircraft, was from Emirates. In January 1993, Boeing and several companies in the Airbus consortium started a joint feasibility study of an aircraft known as the Very Large Commercial Transport (VLCT), aiming to form a partnership to share the limited market. This joint study was abandoned two years later, Boeing's interest having declined because analysts thought that such a product was unlikely to cover the $15-billion in development costs. Despite the fact that only two airlines had expressed public interest in purchasing such a plane, Airbus was already pursuing its own large plane project. Analysts suggested that Boeing instead would pursue stretching their 747 design, and that air travel was already moving away from the hub and spoke system that consolidated traffic into large planes, and toward more non-stop routes that could be served by smaller planes.